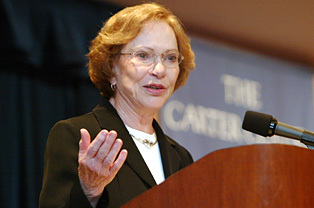 As part of an international effort to reduce stigma and discrimination, the Rosalynn Carter Fellowships for Mental Health Journalism provide stipends to journalists from the United States, Colombia, Qatar, and the United Arab Emirates — and previously in Romania, South Africa, and New Zealand — to report on topics related to mental health or mental illnesses. Informed journalists can have a significant impact on public understanding of mental health issues as they shape debate and trends with the words and pictures they convey. They influence their peers and stimulate discussion among the general public, and an informed public can reduce stigma and discrimination. Want to Become a Fellow?